The fragrant lotus-like white/purple flowers on the mokuren (Lily Magnolia) tree are everywhere this time of year and for the very season-conscious Japanese these are a sure sign that spring is just round the corner: first the ume (plum) trees flower, next the mokuren (the flowers come before the leaves! ), and finally the sakura (cherry) trees blossom. Mokuren is sometimes called Japanese Magnolia outside Japan, but is in fact originally from China. This may be one reason why it is usually written in katakana (which is reserved for foreign imports) rather than kanji. Walking down a street lined with these the other day, I noticed the explanation below tied to the trunk of one of the trees. It gave the name as Magnolia salicifolia, or willow-leafed (Northern Japanese) magnolia which is a variety which does actually originate in Japan. 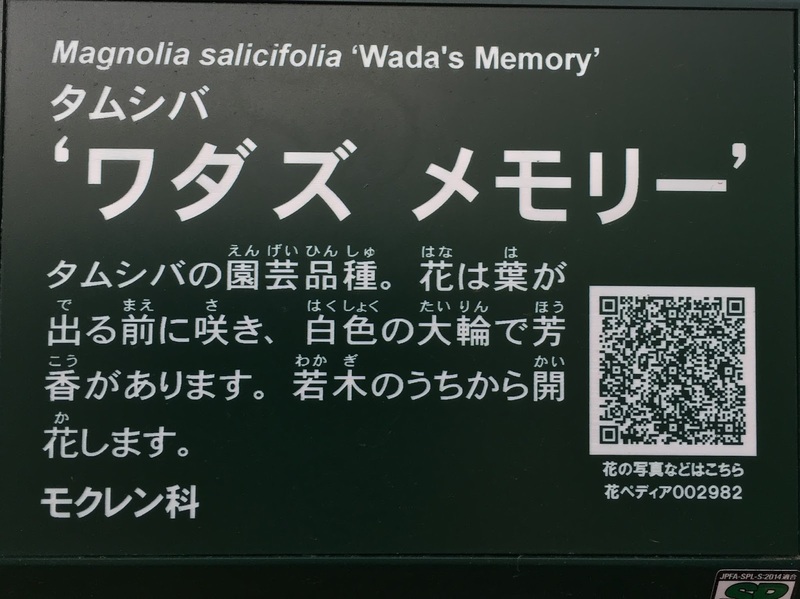 The specific name on the sign is "Wada's Memory" which is listed as a "cultivar", that is a plant variety that has been produced in cultivation by selective breeding. This variety, with double white scented flowers, has gained various horticultural awards of merit. Wada is a common Japanese surname and this variety is apparently named after Japanese botanist Koichiro Wada who introduced many Japanese plants to the West. 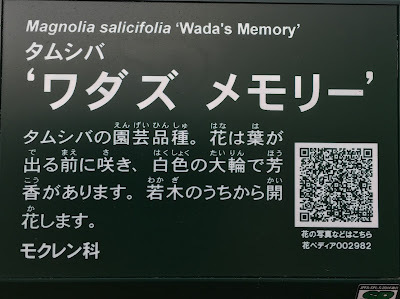 See here for some interesting biographical information on Wada, including the fact that he was still very much alive when the tree was named after him in the 1940s!